"Write a blog! ", they tell you. "It'll be easy!" they say. But there's nothing more terrifying than staring at a blank page wondering what to write. Worse still, creating new content is super important if you want to keep your audience responsive and interested in hearing what you have to say. When working with people in our products and coaching program, we're always listening to our customers and helping them with their biggest issues. Because they tell us exactly what they need help with, we can turn that question into a blog post or video. We find that if one customer is asking a question about it, there are plenty of other people thinking about it too. For example, one of our coaching clients was having issues with setting up the Facebook Ads tracking pixel. So we turned it into a blog post. Plus, we always listen to what people say when contacting our support desk. If it's an interesting question, we'll write about it. Takeaway: In your online business, listen to your customers carefully and they'll give you a ton of ideas for new content. What may be a fairly simple and obvious thing you, may not be so easy or obvious to them. Have you answered a question in the last few weeks that you could turn into a new blog post or video? Just visit any public forum or message board in your niche and you'll see a ton of questions being asked. Every one of these questions serves as a strike of inspiration to cut through writer's block instantly. You may even find other people's answers to the question to give you some ideas for the structure of the content, too! Another great way of doing this is to use Quora.com. It's basically a more up-to-date version of Yahoo Answers. Just search for your niche and you'll find a whole bunch of unique topics you can write about. Takeaway: Type your niche and then "forum" into Google (e.g. "internet marketing forum") and browse the main section of the forum. Choose any question you like, look at any existing answers for a guide on what to write about, and start writing content about it. If you're really hungry for ideas or the other methods just aren't cutting it for you, then you'll love this one. Amazon.com is great for many things (usually which end up in my shopping basket), but it also gives us great ideas. Simply go there and search for books written about your niche. If you look at the reviews, you'll see comments from people saying what they liked - and disliked - about the book. But of course this isn't just about the book - it's also about their personality as a whole. This is not only a great way to get to know your prospects better (so your marketing hits their emotional bulls-eye), but also tells you what sort of content people actually want to see. Takeaway: See what people are saying in the reviews, then use that as inspiration when writing your content. Because you're giving people what they want, they'll usually like the content better than something you've tried figuring out for yourself, too. Don't forget - content is king. Giving great content establishes yourself as a credible expert in your niche, while showing people you can be trusted and actually want to help them - which always helps with sales. P.S. 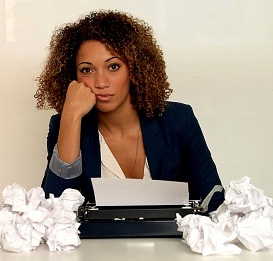 What do YOU do to get rid of writer's block? Leave a comment below! You know yourself pretty well, but struggle to put it into words on your "about me" page for your potential customers. What the heck do you write?!? It's a pretty common situation - especially when you don't have any credibility or fascinating accomplishments to share yet. A quick summary of what you do. Your plans to help people. When done correctly, these topics make you stand out from your competitors and accelerate the relationship between you and your prospects, so you can make more sales and increase your results overall. First, you need to introduce yourself with a quick summary of what you do. This is mainly for the people with short attention spans who just want to know who you are right away, but it also sets the scene for the other three points you'll be covering. Hey – I’m James Francis, the Founder & CEO of Digital Prosperity. Nice to meet you! Through our training programs, we currently help tens of thousands of people from all over the world turn their knowledge and expertise into a successful online information marketing business while living their perfect lifestyle – and I make a cool six figures per year doing the same things myself. Whether you’re a coach, consultant, expert, or just an average person who’d like to turn their passion into profits, I can help you cut the crap and follow a proven system to achieve your goals, just like I’ve done for my other clients and customers. If you're just starting out, you obviously won't be able to brag about all the people you've helped or worked with. In this case, you can simply share what you do as if you're already doing it. I currently help people all over the world to train their dog from a nightmare pooch into their lovable best friend, using proven advice from the world's best trainers and animal behaviorists. Next, you should pivot into your "hero" story so your prospects feel emotionally connected to you, making it easier for them to trust your recommendations. ... But anything similar would be great. That's when you simply explain your story of how you got to where you are today. When I started my online business at the age of 18, I was studying topics I hated at college all day and working a minimum-wage job at a local supermarket on the evenings. Desperate to find a way out and create a better life for myself, I began researching the true ways to become successful with an online business. It took me over two years to sift through all the lies and misinformation, then after much trial and error, I finally had a working system which provided a dependable monthly profit from selling digital information products (e.g. video courses, e-books, software, coaching programs, and similar) to people who needed them. Once that moment came, my life changed forever – and the rest is history. That’s when Digital Prosperity was born. But if you're struggling to come up with something interesting, it's super important that you don't make something up. If you do, you'll contradict yourself sometime in the future and people will be able to smell the BS a mile away (which does nothing for your reputation). Instead, simply tell it like it is - however boring it may sound to you! Remember that even if you're brand new to the online business world, you may still have experience in the topic outside of your online business which you can share. For example, if you're in the weight loss niche, have you ever researched or applied some weight loss strategies? That's your story! If you don't have a backstory related to your niche at all, you can simply write about how you've been interested in the topic for a long time, and you'll be sharing your findings with people. This brings us onto the final section - your plans to help people... Or in other words, why people should listen to you. Yep - even though this page is called "about me", marketing 101 tells us that you should always explain how what you've said so far can help the customer. We do this by sharing our mission statement, vision statement and core values, but this can simply be a short paragraph explaining how you'll be sharing your research and experience with people so they don't need to go through all the hardships that you've been through and can finally achieve their goals. In other words, you're saving them time, effort and money (you can even straight-up say this!). The more specific you are to your niche here, the more your prospects will resonate with you. As an optional step, you can transition into a one-sentence soft recommendation to check out your chosen paid offer for more details, whether it's your main affiliate offer or a link to the sales page for your own product. Just don't overdo it, as it's actually more effective when mentioned briefly as a part of the "about me" explanation. Plus, remember to always add a photo of yourself on the page somewhere so people can put a face to your name. If you miss this out, people will feel like you're hiding something and will struggle to trust you. The photo doesn't need to be professional or worthy of an award, so anything will be fine as long as people can see who you are. With these sections in place, you'll now instantly generate authority-style credibility by positioning yourself as the expert - even if you're just getting started. P.S. Need a website to apply your "about me" page to? We can build one for you here. Ever sat down and stared blankly at your computer screen, feeling completely lost at what to write about? It’s a common problem for most information marketers, as you don’t just want it to be average – you want it to be GREAT, right? But if you use the right strategies, you can generate ideas effortlessly – without having to settle for less-than-perfect content or hire a boring content writer (or even worse, automated software!) to do it for you. Firstly, this entire process becomes much easier if you’re in close communication with your market. After all, if you’re speaking to people on a daily basis and working closely with your customers, they’ll straight-up TELL you what problems they’re currently having. And “tada!” – you have a problem or topic to write about. 1) That’s going to really harm your online business’s profit, as how can you cater to their needs if you don’t know what they are? 2) You need to BECOME closer to your market to really know and understand what they’re going through. So create a Facebook community for your products, create a Facebook page for your brand and regularly post new tips, send an anonymous survey to your email list simply asking them what they need help with, or anything to get closer to what your market really thinks and feels. Then simply create content based around this feedback. However – what if you’re in the beginning stages and don’t have an audience yet? Thankfully there are still ways you can generate ideas simply by observing your market. To start, you should visit a popular forum or message board in your niche (just Google “[your niche] forum”, e.g. “dog training forum”) and spend 10-15 minutes scrolling through the threads, seeing what kind of problems people are having and what they’re currently talking about. For example, if somebody asks how to get their dog to stop barking, you have an idea right there! If somebody asks why their squeeze page isn’t converting well, then you could talk about the biggest mistakes which most people make on their squeeze page. If somebody asks why they’re exercising but putting on weight, you can address that issue in detail. Do you see how all of these strategies rely on being in touch with your audience? That’s the key. As long as you’re truly in touch with your audience and know what they think, feel and are struggling with, you’ll never have great difficulty generating ideas for new content ever again. Simply find out what they want, then give it to them. Creating a video intro (or “logo reveal” video) is the difference between having a professional-looking video course, or one which your customers see as “average”. And even though many people think it’s too difficult or technical for them to do, that’s really not the case. Heck, even a complete “computer newbie” could make an awesome video intro for themselves. But the truth is, you can get started today with the right knowledge.